The last time the Packers played at Solider Field, Aaron Rodgers donned his “Championship belt,” Bj Raji showed the world his dance moves after his interception for a touchdown late in the fourth quarter and as the game clock struck zero the Packers had punched their ticket to Super Bowl XLV. This time around the stakes aren’t nearly as high, but the game is still important for the players and the fans as these two teams continue the NFL’s longest running rivalry. Sunday’s game could be a big one for the Packers defense, especially their pass defense that has allowed 800 yards over the first two games, ranking them last in the NFL. 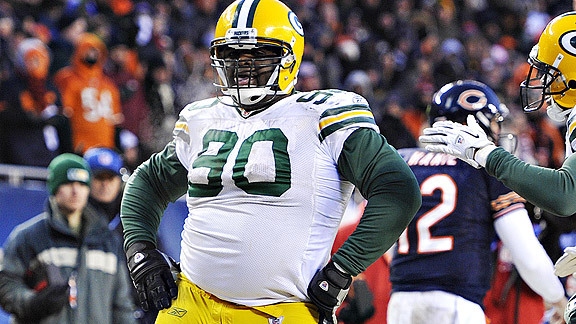 Packer fans hope that Bj Raji will have a chance to do his touchdown dance against the Bears again this season. The Chicago Bears play a slower paced, smash-mouth type of offense, much different than the pass-heavy offenses of the New Orleans Saints and Carolina Panthers. They will run the ball more and look for their quarterback to control the game instead of taking over, which is a style the Packers defense should be able to handle. The Packers showed last year that they can get to Jay Cutler and they will look to do the same this year. With the Bears offensive line banged up, the Packers should be able to apply pressure and frustrate Cutler all game. This pressure from the defensive line will take some pressure off the secondary, which they could use because this will be the first game without starting safety Nick Collins. With the combination of pressure on the quarterback and the fact that the Chicago Bears are coming off a loss in which the offense looked out of sorts, the Packers defense could be primed for a big game. In last weeks game, Jay Cutler completed only 19 out of his 45 passes and the offense as a whole only gained 246 yards, as the Bears lost 30-13 to the New Orleans Saints. While the defense will be looking to get back to the way it played last year, Aaron Rodgers will be looking to keep up his great play. He has completed 70 percent of his passes for 620 yards, five touchdowns and no interceptions in the first two games of the season. Even though he got the win in the NFC Championship game last year, he didn’t play particularly well. He managed to pass for 244 yards, but didn’t throw a touchdown pass and had two interceptions on the game, so he will be looking for a better outing this time out. Division superiority is also up for grabs in this game. With a win the Packers will push their record to 3-0 on the season and will at least share a lead of the division with the Detroit Lions, who at 2-0, play the Minnesota Vikings on Sunday. While it is too early to worry about division standings, it is always nice to see your team on top of the division, and creating space between the other teams in your division early in the year always helps when you get to the end of the season. If the secondary is able to get its act together and can contain Jay Cutler as well as the rest of the Bears offense, the Packers offense should be able to keep up its great play to secure a Packers victory and gain another leg up in the heated rivalry. Jay Cutler, you played 3 hours to die like THAT?! this Jacob Daczyk guy sure knows what he’s talking about!! !